Back row forward Dominic Moon has left Fylde RFC and linked up with Rossendale. 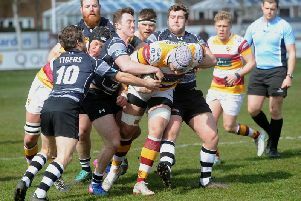 Moon joined Fylde in the close season from Preston Grasshoppers and has figured for the first team on several occasion. But after a talk with player/coach Paul Arnold, it was agreed that a parting of the ways was in the best interests of both parties. Arnold said he was planning to blood younger players in the back row in the closing weeks of the season. He said: “We had a chat about things going forward. Dominic is a 100 per cent genuine lad, but maybe the move to our level at Fylde came a couple of years too late in his career. Moon was one of four players signed from Preston in the summer along with Pete Altham, Phil Mills and Lewis Allen. Mills is the only one from that quartet still at Fylde.